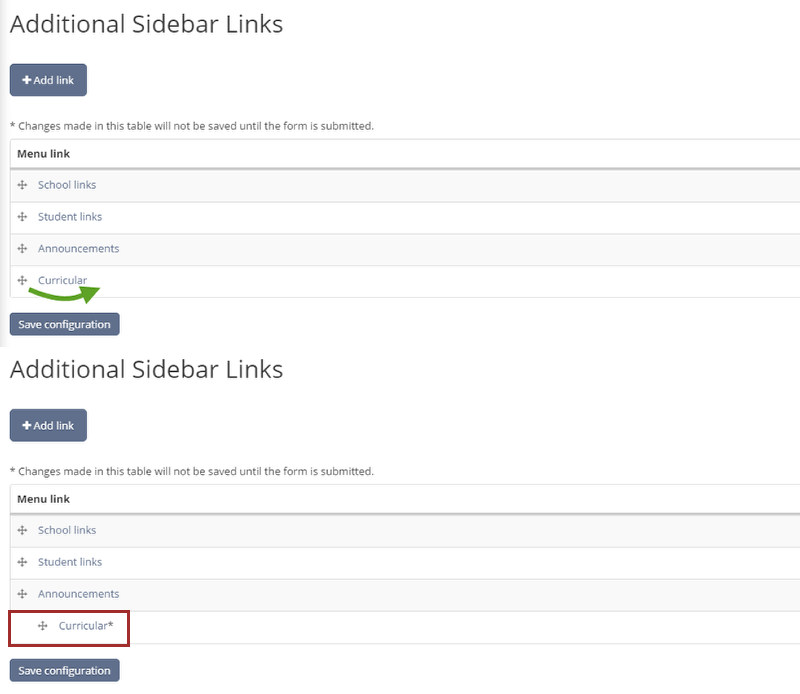 As an administrator, you will be able to create custom sidebar links in Teamie. This is especially required if learners need additional information while they visit Teamie (this information could be about how to perform certain tasks within a classroom, announcement about an upcoming activity in the classroom and so on). You can nest menu links up to one level. 1. From the Manage Teamie block, click Additional Sidebar Links. 2. On the Additional Sidebar Links page, click +Add link. Note: If you have no menu links present earlier, you would be prompted about this along with a secondary Add link option. You can click on any one of it. 3. Type the title of the menu link. 4. Enter the web link to which the menu link should direct. This can be both internal (within your Teamie site) as well as external links. Note: You can set the path to open in the same tab or new tab. 5. 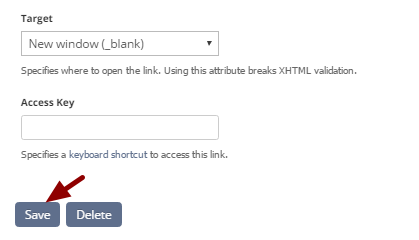 Click Save at the bottom of the page to create the custom link. 6. A success message appears showing that you have successfully saved your configuration. 7. The sidebar link will now be visible for the users to access. 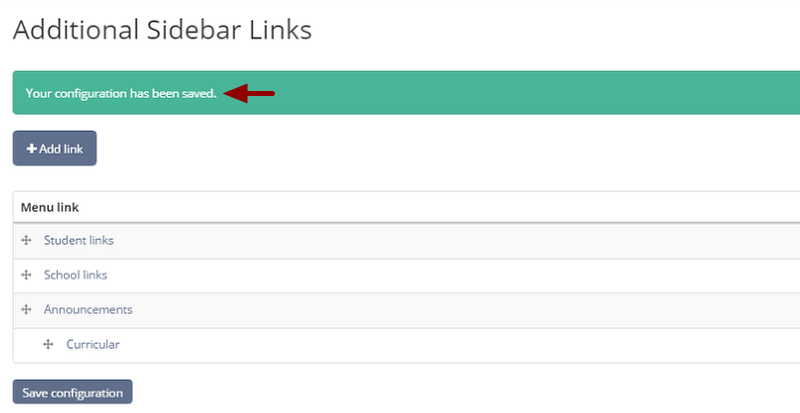 You can edit or delete a sidebar menu link from the Additional Sidebar Links page. 1. Click edit (in the Operations column) of the menu link you wish to edit. 2. On the Edit menu link page, make the required changes and click Save at the bottom of the page to save the changes. 1. Edit a sidebar menu. 2. On the Edit menu link page, click Delete at the bottom of the page. 3. A confirmation message appears. Click Confirm if you are sure you want to delete the custom menu link. Note: Once deleted, a custom menu link cannot be restored. 4. A success message appears showing that you have successfully deleted the menu link. Note: If a parent menu link is deleted, then its child link will not get deleted. The child link will become an individual parent link. 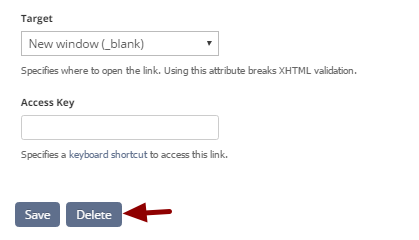 Tip: You can also delete a custom menu link from the Additional Sidebar Links page. You can change the order of the custom menu links by dragging and dropping them to their new position. 1. Click Additional Sidebar Links from the Dash sidebar. 2. You will see a list of all the custom menu links you have added so far. 3. Press and hold a menu item you want to reorder and drop it to a new position. 4. An asterisk symbol will appear in front of the re-ordered menu item which indicates that re-order activity is performed but change are not saved yet. It will disappear once the changes are saved. 5. Click Save Configuration to save the re-ordered menu items. Note: If you re-order the parent menu link, the child link will get re-ordered automatically with it. 6. A success message appears showing that you have successfully saved the configuration options. 7. The reordered structure will be visible to the users as soon as you save the configuration. Teamie allows you to nest a link inside another link up to one level. So when a user clicks on the parent link, link nested inside the parent link will be expanded. 1. Add a custom sidebar link. 2. While adding a custom sidebar link. tick Show as expanded. 4. For nesting another menu link inside a parent link, go to 'Additional Sidebar Links' page, press and hold the required link you want to nest and drop it right below the parent link and then drag it to the right side. 7. Now user will see the nested link inside the parent link and can access it from the side navigation bar. By default, custom menu links will open in the same browser tab, which works fine if all the custom menu links point to pages inside your Teamie site. However, if you wish to point to an external link, it is best recommended to open the link in a new browser tab when clicked. That way users are not being taken away from Teamie site after clicking the custom menu links. 2. While adding a custom sidebar link, click the Target drop-down menu. 3. Select New window (_blank). 5. A success message appears showing that you have successfully saved your configuration. Now this sidebar menu link, when clicked, will open in a new tab. As an administrator, you can temporarily disable custom menu items from the side navigation bar. Disabled custom menu items does not appear in the side navigation bar but are available on site. So this allows site administrator to reuse disabled custom menu items in future by just enabling them. 2. On the Additional Sidebar Links page, un-tick the Enabled checkbox next to the custom menu item you wish to disable. Note: In case a parent menu link is disabled, then the child link will automatically won't show up in the Dash custom sidebar links. But, if a child link is disabled, then the parent link will still show up in the custom sidebar links. 4. A success message appears showing that you have successfully saved the configuration options. 5. The disabled custom menu items won't be visible anymore.